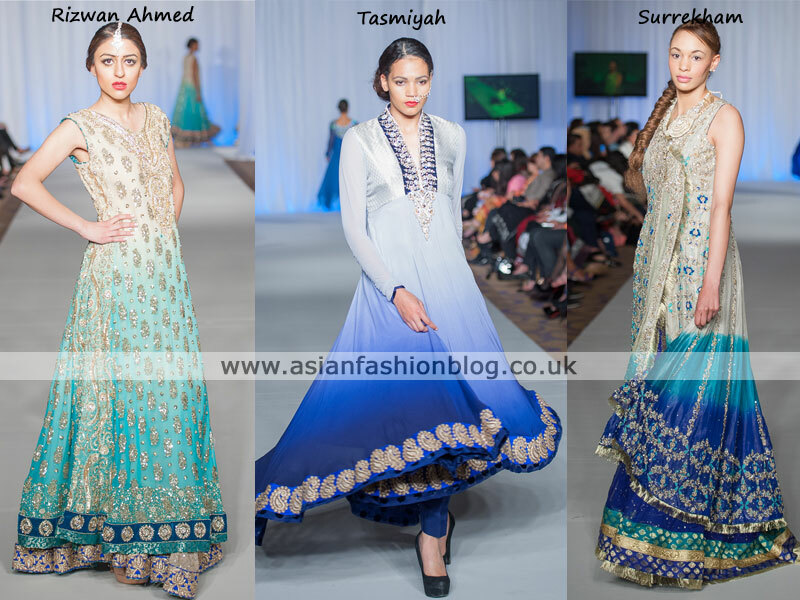 Over the weekend of 8th and 9th June, The Grand Connaught Rooms in London held host to Pakistan Fashion Week 4. The event featured 22 catwalk shows and I'll be dedicating blog posts to my favourite collections, but in the meantime, here are some of the key looks! 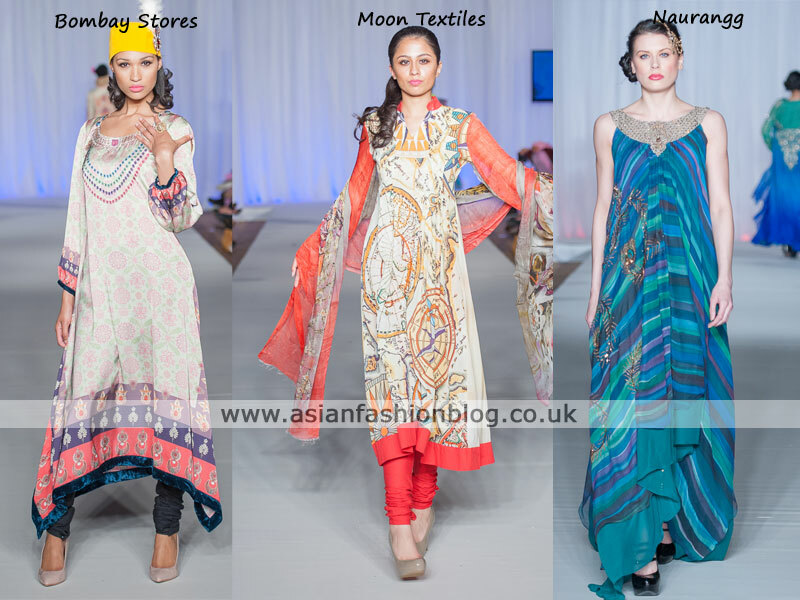 The show featured a range of outfits from formal dresses and bridals to more casual outfits like these stylish prints suits from Bombay Stores, Moon Textiles and Naurangg by Uzma Shah & Moeeza Rabbani. Gul Ahmed also had some beautiful print outfits which I'll be blogging about in more detail soon. As is the current fashion for Pakistani formalwear, there were A LOT of long flowing maxi dresses and evening gowns. Shimmering outfits with slight hints of colour were also a feature I noticed in a lot of the collections. The three above are from Rizwan Ahmed, Rana Noman and Naurangg by Uzma Shah & Moeeza Rabbani. More long flowing dresses, but this time with an ombre-effect going from white to blue. It must be a popular colour combination to be included in three designer's collections. 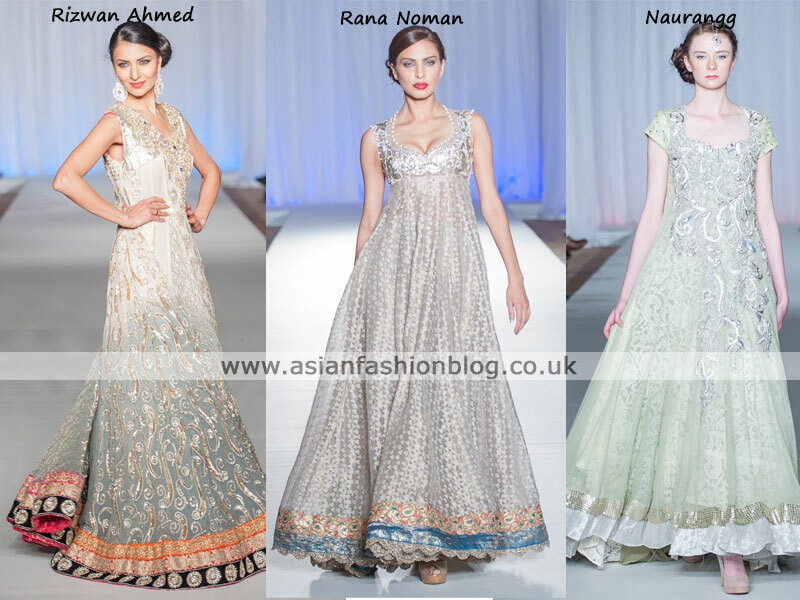 Interestingly I first remember seeing an outfit like this in a collection by Shazia's Bridal Gallery in 2010 - check it out here (5th pic down). Did you attend the show? What did you think of the event and which collections caught your eye? Look out for my upcoming blog posts covering PFW4 London in more detail!